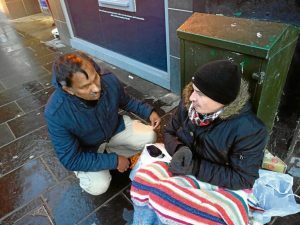 Members of Dundee’s Muslim community helped spread some festive cheer by handing out gifts to homeless people. Volunteers from the Ahmadiyaa Muslim Youth Association (AMYA) also visited the Balhousie St Ronan’s Care Home in Dundee’s Dalkeith Road to donate goodies. The visits were part of ongoing charitable and community services the group provides to people across the city. The volunteers handed out warm clothing, food, sweets and greeting cards, as well as spending time with people and checking on their health and wellbeing. The group also gave sweets and cards to the care home. Shoaib Khan, the youth leader for Scotland Ahmadiyya Muslim Youth, said: “Our passion as proud, Scottish Muslims comes from our faith, which teaches us to serve those in need — regardless of their faith, gender or background. Islam also teaches that the elderly must be respected and treated kindly. The AMYA has a timetable of events next year, with a planned clean-up on Dundee Law and fundraising activities for local charities, such as the Archie Foundation. Mr Khan added: “We are raising money for very worthy causes, which not only benefit the local community but also internationally. The AMYA UK is an auxiliary body of the Ahmadiyya Muslim Association, with a membership of 7,500 British Muslims. The Dundee branch is one of more than 100 local groups of the AMYA spread across the United Kingdom, with the headquarters in London. The organisation is committed to the spiritual, moral, intellectual and physical development of young Muslims. It runs a regular programme of structured activities for its youth, with a mix of academic, sporting, social welfare and charitable works which keep members engaged. Among those involved in the activities locally over the past few days were local youth organisers Dr Golam Kabir and Naseh Ahmed. Share the post "Helping the homeless as group hands out food and clothes to those on Dundee streets"